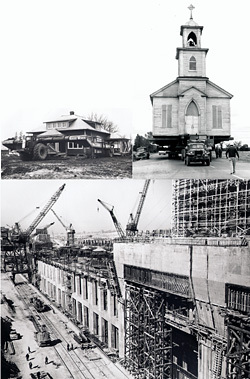 Clockwise from top left: The last house from the village of Wales is moved to Ingleside, Ont., during construction of the St. Lawrence Seaway and Power Project in the 1950s; a church is delivered to a new location; construction of the huge powerhouse on the Canadian side of the border was a mammoth undertaking. Tuesday, July 1, 1958. Dominion Day. Through the gentle morning drizzle, Jim Brownell rode his bicycle toward a high hill overlooking the St. Lawrence River near Cornwall, Ont. The youngster was on his way to witness the spectacle of a lifetime. He was not alone. Before sunrise, thousands of people had gathered on a nearby ridge and along a dike to watch the culmination of four years of elation and frustration. At the time, Cornwall radio station CKFS, cleverly calling itself “the best station by a dam site,” announced that at 8 a.m. a huge cofferdam eight miles upstream from Cornwall would be blown to bits and an enormous wall of water would wash across the countryside submerging seven historic towns and inundating more than 200 farms. When the resulting flood finally filled Lake St. Lawrence, a man-made reservoir behind the newly constructed Moses/Saunders hydro dam, Ontario would enter an era of living better electrically. The previous few years had been an exciting time for 10-year-old Jim and his school chums from the villages that would disappear. They marvelled as massive machines roamed the region, transforming the landscape, diverting the river channels, and moving or levelling homes, churches, businesses and even cemeteries. In all this apparent mayhem, modern towns were springing up along the newly created St. Lawrence River Seaway shoreline. The upheaval had begun on Sept. 19, 1955, when Ontario Hydro invited news reporters to the old village of Iroquois on the north shore of the river to watch as the home of Mr. and Mrs. C.A. Roberts was hoisted from its foundation and carried to an area designated as New Iroquois, about a mile and a half north of the old town. It was the beginning of a “rehabilitation” program for the settlements and farms that would disappear beneath the redirected river and become known as The Lost Villages. Over the next four years, through triumph and tears, the billion-dollar St. Lawrence Seaway and Power Project would transform the face of commerce on the river. The vast St. Lawrence River system had long been considered one of Ontario’s finest sources of waterpower. Its even flow of water, if dammed and harnessed, could produce countless kilowatts of electricity. Taming the Long Sault Rapids to create a navigable channel for large ocean- going ships and establish the headwaters needed to generate electric power at Cornwall and at Massena, N.Y., would be a major challenge. The dream had existed for almost as long as the notorious section of the river had tormented early day explorers. The rapids were a formidable obstacle, but their raging power coupled with the river’s constant flow could, if tamed, have great benefits. In 1913, seven years after the creation of the Ontario Hydro-Electric Commission, a provincial board examined their hydro capacity. By 1924, Canada and the United States appointed a Joint Board of Engineers to study the river’s potential. Two years later, it recommended bilateral Canadian-American development and an International Treaty was signed in 1932. However, the U.S. senate refused to ratify the agreement. Thirty years later, on June 30, 1952, Canada, presumably tired of waiting for the Americans, said it would build the power project alone if necessary. The warning worked. On Aug. 10, 1954, an international sod-turning ceremony at Cornwall and Massena marked the official start of construction of the International St. Lawrence Seaway and Power Project. These were two megaprojects that were mutually exclusive, but inevitably interlinked since locks were required to bypass the power project and expand the outdated St. Lawrence River system of canals to accommodate large ocean- going ships. The hydro project would provide Upper New York State and Eastern Ontario with much needed electrical energy that could attract major industrial development. The projects would be built at the same time and, when the work was completed four years later, they had employed more than 25,000 people and cost over a billion dollars. Because of the power project, the water level on the St. Lawrence would be raised and this would result in the flooding of a number of towns and villages along the Canadian shore. Harnessing the river’s hydro power required building three dams and two powerhouses. The hydro dam, spanning the river channel between the eastern end of Barnhart Island in the U.S. and along the Canadian shore west of Cornwall, would include powerhouses on either side of the international border. On the Canadian side, they would call the dam Robert Saunders to honour the late chairman of Ontario Hydro, while on the American side, it would bear the name Robert Moses, chairman of the New York Power Authority. The Iroquois Control Dam, half a mile long, would be built 25 miles upstream from the hydro dam near Point Iroquois. It would regulate the outflow of water from Lake Ontario. The Long Sault Control Dam, constructed at the west end of Barnhart Island, three miles west of the hydro dam, would regulate the height of the water behind the Moses/Saunders dam. This dam would be built in two sections, and require the “de-watering” of the St. Lawrence River at the Long Sault Rapids. Here, engineers would take advantage of the natural diversion of the river into two channels at Long Sault Island. While building the southern portion of the control dam, water was diverted from the south channel into the channel north of Long Sault Island. During construction of the northern portion, engineers would divert the flow of the river into the southern channel, and through the completed southern structure of the control dam. When the water finally returned, it would form the 30-mile-long man-made Lake St. Lawrence that would submerse the historic Long Sault Rapids under 90 feet of water and envelop more than 20,000 acres of land. As construction of the hydro dam progressed, local residents were afforded a unique opportunity. On the dry jumble of rocks where once had raged the Long Sault Rapids, many searched for relics of another time. Jim Brownell found nothing, but a youngster named Arthur Raymond of nearby Sheeks Island hit the jackpot when he uncovered four ships’ anchors and 11 mortar shells with gunpowder still dry and ready. The stuff had been thrown overboard from an American ship fleeing the Battle of Crysler’s Farm during the War of 1812. As the massive construction project continued night and day for four years, the surrounding countryside was cleared of bushland and trees, including an elm in the village of Moulinette. According to an unofficial ring count, the tree was more than 500 years old. So ancient was the doomed elm that, as legend has it, explorer Samuel de Champlain, on one of his voyages on the St. Lawrence River in the 1600s, had rested and ate his lunch beneath her branches. In the “rehabilitation” scheme, residents of the villages that would disappear under Lake St. Lawrence were offered homes in one of the two newly planned towns: Ingleside and Long Sault. Thus, Mille Roches, Moulinette, Wales, Dickinson’s Landing, Farran’s Point and Aultsville would become known as The Lost Villages. These villages were first settled in 1784 by United Empire Loyalists seeking sanctuary on the north shores of the St. Lawrence away from the turmoil of war in the U.S. Most of the early settlers were disbanded soldiers of the The King’s Royal Regiment of New York. The British government had supplied the loyal immigrants with land, basic tools, food rations and clothing for the first three years. Faced with dense forests and no roads, the colonists lived an austere existence in primitive log shacks. However, they changed the face of the land by creating small but vibrant settlements and farms along the mighty river. Mille Roches, meaning Thousand Rocks in French, was the closest community to the west of Cornwall and was noted for the large limestone quarries north of the village. Two kilometres away on old Highway 2, lay Moulinette. It had been settled by the Dixson family. Adam Dixson was the first person in the region to harness the hydro power of the St. Lawrence and made a small fortune with commercial and milling operations. He was also the driving force behind the construction of Christ Anglican Church at Moulinette in 1836. Today, the church stands at Upper Canada Village near Morrisburg, a monument to the man whose wife’s funeral was held in the church before its completion in 1837. Wales, the only inland community of The Lost Villages, was built on a land grant given to Dr. James Stuart, of the King’s Royal Regt. From 1810 to 1957, five generations of Stuarts had lived on property once known as Dickinson’s Landing Station. The name changed in 1860 when Edward, the Prince of Wales and later King Edward VII, on a visit to the community asked why such a small village had such a long name. Townsfolk got the message and renamed the place Wales. The French explorer Robert Cavalier Sieur de LaSalle established the settlement of Dickinson’s Landing in 1669 as a trading post because it was at the end of an arduous portage around the Long Sault Rapids. It was named for Barnabus Dickinson, who had come from Massachusetts before 1812, and earned local fame and respect for transporting mail by boat and stagecoach. Jacob Farrand, a lieutenant in the King’s Royal Regt. when he left the U.S. with the Loyalists, used his land grant to establish Farran’s Point. Aultsville honoured Samuel Ault, who was a member of the first Canadian parliament in 1867. His father, Nicholas Ault, had dammed the creek at the village site when it was still known as Charlesville. He built a sawmill and shipped lumber to Montreal. Aultsville boasted 400 inhabitants in 1879. The former hamlets of Mille Roches and Moulinette combined to form the new town of Long Sault, eight miles west of Cornwall while the villages of Wales, Dickinson’s Landing, Farran’s Point and Aultsville became a new town called Ingleside, 13 miles west of Cornwall. With such a long and impressive heritage, it is little wonder that many residents were dismayed at the looming loss of their homes and their history. In June of 1954, the issue of compensation dominated the debate. Ontario Hydro had revealed its “rehabilitation” program and dispatched what locals called a “hydro circus” to hold public meetings in the communities. Most did not like what they heard. Hydro offered property owners cash at market value plus 10 per cent or they could choose new houses, farms or businesses of similar size and quality. However, the market value was severely depressed since it had been known for years that the area would one day be flooded. Many owners demanded full replacement value while others balked at what they called “chicken co-op” houses in “P-shaped” streets in new towns far removed from the old river front. Late in 1954, Ontario Hydro introduced a bold new idea. Houses that could be moved would be moved. Nearly 70 per cent of Iroquois residents liked this plan and to some extent the market value issue was defused. However, negotiations between Ontario Hydro and homeowners to determine property values would be conducted on an individual basis. Not surprisingly, some residents were more skilled than others in the art of barter and were quite happy with the outcome. Others, especially those who owned waterfront property, were not. The move to the new communities with modern homes, running water, cement sidewalks and new business ventures known as shopping malls would take some getting used to but there were distinct advantages such as street lighting, indoor shopping and paved streets. Some homeowners would for the first time enjoy indoor plumbing. The benefits probably transcended the problems residents endured. Most notably for the region however was the access to lots of reliable power. The Moses-Saunders dam, a mammoth structure 3,300 feet long, would produce nearly two million kilowatts of electricity shared equally between the New York Power Authority and Ontario Hydro; enough to serve two cities the size of Washington, D.C. Crossing the river at Cornwall, it featured 32 generator units; 16 American and 16 Canadian. The international boundary between Canada and the U.S. was altered to bisect the dam and provide each country with an equal number of generators and the Snell seaway lock on the American side of the river allowed ships to navigate around the power dam. Today, on the American side, more than half the project’s electrical output supplies the Aluminum Company of America and General Motors Corporation, the region’s two largest industries that employ thousands of up-state workers. In Canada, the power is distributed through the Ontario Hydro general power grid. Interestingly enough, the city of Cornwall does not receive its electricity from the Moses/Saunders dam, but rather through the Cedar Rapids line fed from Quebec. Still, the St. Lawrence Seaway Authority has its head offices in Cornwall which, according to Cornwall’s economic development officer, Mark Boileau, not only creates jobs but also brings the high profile of a major corporation to the region. The operation of both the seaway locks and the power generating station also creates stable employment. Boileau says the major impact of the project came with the jobs created during the construction period and the resulting spinoffs in tourism. Part of the rehabilitation program included the creation of nine parks and beaches between Lancaster, Ont., and Iroquois, with Crysler Park as the historical centre and focal point of an expanded tourist industry. The picturesque Long Sault Parkway commemorates the rapids and links nine of the 18 new islands created when they raised the river and flooded the land. Eventually, 6,500 people, 225 farms and 531 homes were relocated. In addition, the mammoth hydroelectric and seaway development affected 17 churches and 18 cemeteries, some established by United Empire Loyalists. Ontario Hydro re-interred more than 2,000 bodies but only when requested to do so by kin. The Brownell family farm was not flooded since it was on land high enough to escape the raised waters of the St. Lawrence, but young Jim had watched in fascination as the Canadian National Railway rebuilt about 40 miles of track north of the family farm and 35 miles of the old Highway 2 were relocated to the south. On Inundation Day, Jim Brownell, like other eye witnesses to history, expected to see all kinds of action when the de-watered river behind the hydro dam filled again. Instead, after the massive explosion propelled debris sky high from the blown cofferdam, the expected great wall of water was instead just a trickle. By the second day, water had crept over the village of Moulinette, and had made its way to Wales and Dickinson’s Landing. By the end of the third day, Aultsville and old Iroquois had disappeared, and the eastern section of Morrisburg was under water. It took three days for the villages and farmlands to disappear. The first week of July 1958 was crammed with celebrations up and down the river. There were predictable parades, baseball tournaments, and the dedication of the new Ault Park by Prime Minister John Diefenbaker. There were countless congratulatory speeches by notables of the day, including Ontario Premier Leslie Frost. However, Robert Saunders, who as Chairman of Ontario Hydro since 1948 had led the parade of progress, was not there to see the opening of the massive hydro dam named for him. He was killed in a plane crash while on company business in 1955.Yet his bold vision of taming southern Ontario’s last major hydro site on the St. Lawrence River would be an economic shot in the arm for Eastern Ontario and Upper New York State. On June 26, 1959, a year after Inundation Day, Queen Elizabeth joined with U.S. President Dwight D. Eisenhower at the St. Lambert Locks near Montreal to officially dedicate the entire St. Lawrence Seaway and Power Project. By then, the lost villages had been under water for a year, their former residents adapting to life in the new riverside communities. Yet they had not forgotten the past. The Lost Villages Historical Society was created in 1977 when a group of local people, including the late Fran Laflamme–the first president–sat around a kitchen table and discussed how they could best honour their history. In 1984 they moved an 1830s log house to Ault Park and in 1992 opened it as a museum. Since then, 10 buildings, including the Fran Laflamme Memorial Resource Centre, have been added, and the organization has developed an impressive learning kit that it shares with schools. 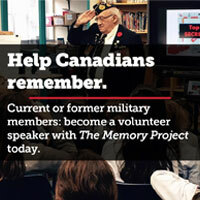 The society’s Web site, which is www.lostvillages.ca, has helped spread the story worldwide. Today, the Lost Villages Historical Society has more than 200 members led by its president, Jim Brownell, who as a lad rode his bicycle to watch it all happen 45 years ago.